Should you write blog posts or email newsletters? Written by Colin Nederkoorn on November 21, 2012 . Your time is limited. You have to choose between writing a weekly blog post, or writing a weekly newsletter. Will a blog post or newsletter be a bigger win for your business? Benefits of writing a newsletter? The #1 reason to write a newsletter is to strengthen your relationship with an existing audience. Each time you write a newsletter and hit send, you have an immediate audience. When you run a blog, someone has to discover that there’s a new article EVERY TIME you post. Sure, there’s RSS, but let’s face it, only geeks subscribe to RSS feeds. People who want to hear from you won’t remember to go regularly to your blog to see new articles. Let’s say your target is to reach an audience of 1000 people who care about the problem your business solves. With a newsletter, you can build an engaged audience of 1000 over time. Direct people to your newsletter sign up page. You can even start building interested readers before you write your first newsletter. But, newsletters are not without their drawbacks. Blog posts address some of these drawbacks. People often ask for an archive of our newsletters to share with friends. If you’re writing interesting content (and you should be), then people will want to spread it on twitter, linked in, and Facebook. If you write articles and let’s say you write an article about “cylon flavored turkey gravy”. Chances are that when someone searches for that in the future they will find your article. 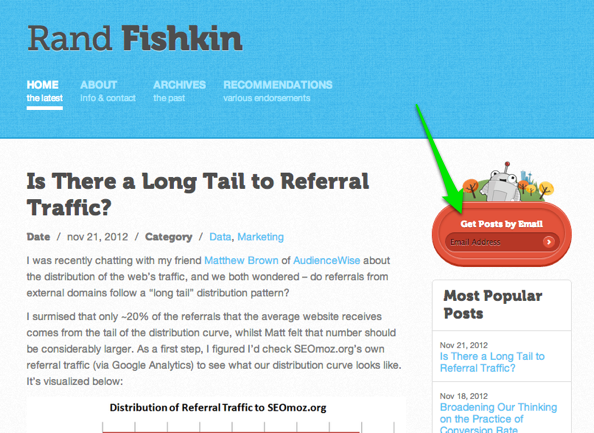 Rand Fishkin from SEO Moz has an email capture form on his website: Like Rand, you could use Feedburner, a service to let people subscribe to new blog posts. Do opens and clicks in the email take a hit? Are people sharing the content more? Is that driving more visibility and more signups to the email list. My hypothesis is that this might be the best of both worlds. 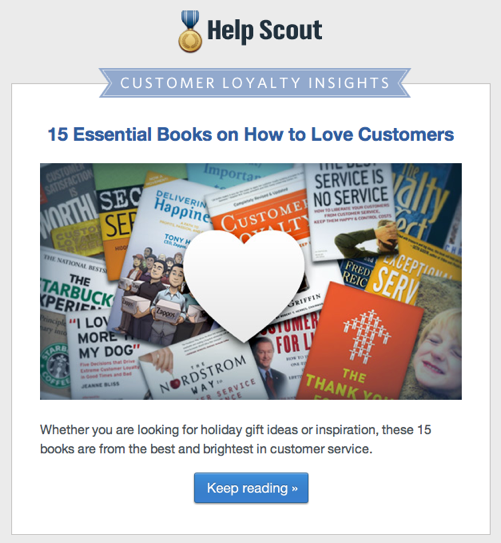 Have you tried send an email newsletter? Or posting lots of blog articles? Let me know in the comments below what your thoughts are on any of the three approaches, and what has worked for you.